In the tutorial that will follow, we will discuss about the ins and outs of Sea of Thieves. By that, I don’t mean just getting from point A to point B or shooting down an enemy. We will go in depth about strategies, combat, ship mechanics, voyages and so on. A quick note though; what’s about to follow is based on hundreds of hours of gameplay. I am an experienced captain, but I am far from perfect, for I am still learning myself. First and foremost, prepare yourself for the journey at hand. I know you’re eager to set sail and all that but take some time to familiarize yourself with the mechanics of the game. Look inside your inventory, and see what weapons you have at your disposal, what items you can use. At this moment, the only Trading Companies are the Gold Hoarder Company, Order of Souls and Merchant Alliance. Through them, you can acquire voyages, which reward you with gold and reputation. By advancing your reputation level with these Companies, you&apos;ll unlock better paying and more challenging quests, but also better-looking cosmetics. Upon purchasing a contract with any of them, you will have to return to your ship and propose and vote on the contract acquired. This is done at the Voyage Table. Gold Hoarder - This NPC lives in a small green tent, usually in the middle of the Outposts. You can easily identify him by his clothes and the glistening gold on his body. Upon talking with him and accepting his voyages, you&apos;ll be given two types of maps: "X marks the spot" and "Riddles". For the first one you&apos;ll have a map with an island on it. Your job is to identify that island on the word map on your ship and sail to it. Upon arrival, you&apos;ll need to find the red "X" on the actual island and dig up the treasure. For the second type of voyage, the "Riddle", you will be given a scroll with a hint on it, followed by several blurred lines. The first sentence is always going to reveal the location to which you need to sail. Upon arrival, you will have to perform certain tasks to unlock the next stage of your riddle. Such tasks can be playing your instrument at a location, shining light upon a landmark, etc. Once you have finished the voyage, you will need to return with the chests to the Gold Hoarder. Upon selling them to him, he will reward you with gold and reputation. Order of Souls - This NPC usually resides under the "Potion Shop". She lives in a dark colored tent, dressed in grim clothes. She delves in mystical arts, in the magical side of the world of Sea of Thieves. She will send you on a journey to defeat a cursed pirate crew (NPC) and bring back to her their captain&apos;s skull. You will receive a scroll that will tell you who you need to defeat and where. 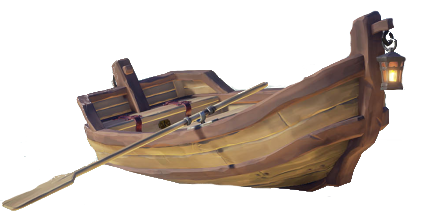 The same as with the Gold Hoarder, you will have to identify the island and sail to it. Upon arrival, you will have to search the land for the skeleton crew. You will be able to tell if you&apos;re getting closer to them when you&apos;ll hear a fast-paced music intensifying. Skeletons of different types will spawn in waves until the Captain will appear. Once you&apos;ve defeated the encounter you will have to return to an outpost and sell the skull to the NPC for gold and reputation. Merchant Alliance - The last but not least Company is the one that will send you on journeys to collect different things. This NPC always resides on the dock, near the Shipwright. They will provide you with contracts to acquire animals (pigs, chickens, snakes), explosive barrels, crates of supplies, etc. and deliver these to another Outpost. Upon accepting their task, you will be given a scroll with the Outpost that you need to deliver the goods, the required goods and the amount of time you have to do it. You will haev to get the cages from the NPC and sail to different islands in order to fill the cages with the goods. Once you have everything you need, you will sail to the designated Outpost and sell the crates to the Merchant of that establishment for gold and reputation. An alternative to merchant contracts is the Cargo Runs. Same as with the normal merchant quests you will have to acquire the contract from the Merchant NPC. You will be instructed to pick up a certain amount of goods (crates of rum bottles, crates of cloth and plants) from a specific NPC and deliver them elsewhere in the best condition possible as they can be damaged on route. •	Banana: The fruit of life; no, literally, this fruit will replenish your health when you eat it. You can have a maximum of 5 on you. •	Cannonball: The ammunition for your cannons. You can have a maximum of 10 on you. •	Plank: The wooden plank is used to patch up holes, when your ship is taking damage. It will prevent water from infiltrating below your deck. You can have a maximum of 5 planks on you. •	Tankard: When life is hard, or you can’t keep your lips off of alcohol, the tankard is your friend. Taste the fine, ish grog but keep in mind not to drink while sailing. •	Shovel: Dig, dig, dig…basically. The perfect tool for digging up treasure. •	Lantern: When darkness slowly creeps on you, shine a light. Or, use it when a riddle tells you to. •	Bucket: When taking water, your second-best friend is the bucket. Use it wisely to bail water from below the deck or fill up other ships. •	Compass: “We need to go left!”, “No, we need to go right!”. Well, the compass is the right tool to guide yourself where needed. •	Concertina: A lovely, romantic instrument meant to win the heart of any lass out there. •	Hurdy Gurdy: A more “bassy” instrument that will make your lass tremble. •	Blunderbuss: A big and dangerous weapon, designed to make people cry from close range. •	Cutlass: A pointy fast blade made for slicing ham. •	Pistol: Point and shoot. You don’t need anything else to do with it. •	Eye of Reach: Just a cracked spyglass that shoots people from a distance. •	Spyglass: I see with my little eye, a …SHIP! •	Cursed Cannonballs: Did someone look at you in a wrong way?! Time to curse them a bit! 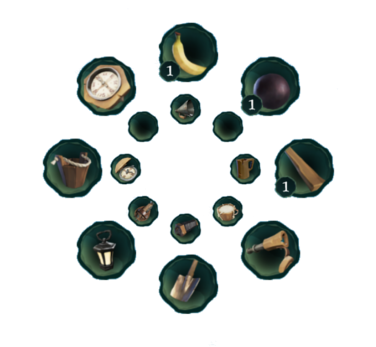 •	Pocket Watch: It’s “time” to move to the next part of the tutorial as long as you’ve handed in the merchant contract on time. Next on our agenda, resources; Never leave an island without scavenging every single resource there is on there. You’ll find bananas, planks, cannonballs, cursed cannonballs, the essential things for you and your ship. I have a saying, when it comes to resources: You can never have enough! So, keep that in mind when you’re on islands, for a battle can last for even more than an hour. Now comes the good part, ships; I know that your first impulse would be to drop some sail and just fool around at the helm, but I beg you to hold your pants for a few minutes. Let’s get to know the ship that you have. This small ship is designed in such a way to be easily operated by one or two people. She is equipped with one sail, making it less fast but more maneuverable. Behind the helm you will find the anchor and the ropes for setting the length and angle of the sail, placed at the sides of the ship. Due to its design, everything is easier and faster, from dropping and lowering the anchor, to setting sail. As you walk down the stairs, from the helm, you will find two red barrels at the port side of the ship. These are storage containers for the cannonballs. At the back of the vessel, you will come across the word map, from which you can plan your next journey. Walking towards the stairs that lead below, you will find the ammunitions box for your weapons, to the starboard side. Going below deck, to the port side, you will find the brig, a small one by one cage where the trouble makers are sent to rot for the rest of their days, or until they apologize. Next to it, you will find the elixir of life, known as the barrel to refill your tankard with grog. In the middle, you will stumble upon the storage barrel for your planks. Along the port side you will find the clothing chest, vanity chest and equipment chest. Last but not least, on the starboard side, lays the barrel for your little yellow friends, the bananas. Before you set sail, you need to check the world map and determine the direction in which you need to go. After having that clear, you want to raise the anchor and slowly turn the ship in the correct way. Once that’s done, check the wind and angle your sail to match its direction. Now, all you must do is drop your sail. Steering involves tenderness, knowing how to treat her (your ship). Turn her smoothly, and she will reward you by keeping you afloat. In comparison to the big ships, the sloop is more agile, takes turns faster and more aggressive and for that, you will need to get used to her. For example, when trying to center the ship after a full starboard move, you will want to go a bit port side with the wheel and afterwards bring it to a neutral position (you can tell if the ship’s wheel is centered when you hear an audio que and the golden spoke is facing up). If you bring it directly to a neutral position, you will notice that the ship will still move a notch towards starboard. It&apos;s important to keep in mind that the sloop is the fastest ship while going against wind. When it comes to parking, you shouldn’t go full sail and just drop the anchor, while hitting the shoreline. As you approach the island, start raising the sail slowly. This way, you will glide the ship in, not ram her in. Be aware of the depth of the water and when you believe you’re close enough, drop the anchor. (it will take a few tries till you’ll manage not to hit the shoreline). Now, it’s time to ready your ship by making sure that the sail is fully risen, and your anchor is up. By having the anchor up, you will be able to maneuver the ship left and right, without moving forward or make a quick getaway. Before leaving the ship, make sure you empty your inventory, so you can have space for new resources. With a sloop, fighting can be tricky. This is not a powerful nor fast ship; it’s strong points are the size and maneuverability. With this in mind, you need to use your wits in order to survive in a fight. Use your environment to your advantage, go places where a Galleon or a Brigantine cannot fit. Go in forts, using it as a “safe heaven”, though be quick on repairs when approaching one. Never “sit” at the side of a Galleon or a Brigantine; drop anchor and use the speed of the aforementioned ship to your advantage. Use the time in which they will turn around to make your quick retreat. Remember, the Sloop operates faster in every mechanic, from steering, to angling sails and raising the anchor and sailing it against wind will keep you ahead of your enemy. Let us start with the upper deck, at the wheel. Behind it, you will find the angle and length ropes for the back sails; moving down on the stairs you will stumble upon the ropes for the middle sail, the ladders that allows you to get on and off the ship and 4 cannons on each side of the ship. Looking behind, towards the back of the vessel, you can see the captain’s quarters where captain stuff happens. At the middle, you will find the ladder that leads to the crow’s nest and moving to the front of the ship, you will play with the ropes for the front sail and with the anchor, situated in between them. Going below deck, in front of you is the table with the world map and on the right side you can see the same elixir of life, the barrel to refill your tankard with grog. Next to it, the barrel of bananas. Beyond the world map table, in the left corner, 3 barrels for cannonballs wait silently, each being able to eat 100 ammunitions. Next to them, a big wooden barrel to hold your planks. In the other side, past the world map table and the stairs, you will find the box of ammunition for your weapons and to its left, the equipment, clothing and vanity chests. On the lower deck, awaits all of you naughty boys and girls, the brig; so, you better not misbehave. Before you set sail, you need to check the world map and determine the direction in which you need to go. After having that clear, you want to raise the anchor and slowly turn the ship in the correct way. Once that’s done, check the wind and angle your sails to match its direction. Now, all you must do is drop your sails. Sounds familiar, right? Now, that you already know what you’re doing, keep her with the wind in her sails and everything will be perfect. In comparison to her little sloop sister, the galleon is slower and bulkier in terms of maneuverability. Try avoiding making sharp, rash turns for she doesn’t really like this rough play. Think first, be one step ahead of your ship and the sea when it comes to steering, for the wheel spins more, taking more time to make a maneuver. One crucial difference between the galleon and the sloop is the visibility. You will have your main and front sail in your face the whole time, unless you tell your crew members to raise them a bit, so you can see. An alternative would be to have someone constantly shout at you to watch where you’re sailing, basically guiding you on the sea. My advice would be to raise the sails a bit, if you’re not chasing anyone and the treasure won’t dig itself out of the ground and start running around. With this big ship is even more important to fully raise the middle and front sail when approaching an island and the order in which you’re doing it matters. The middle sail gives you more speed and that’s the one you wish to get rid of first. Once anchored at an island, your job will be to take care of your big princess. Start checking her sails, making sure that every single one of them is fully risen. Raise the anchor and wiggle the ship around, based on your needs. Make sure to check your storages, letting your crew know what the ship lacks. Keep an eye out at all times for other vessels. The biggest challenge with a big ship is communication. I can’t emphasize how important is to properly communicate with your crew. Let them know what you need, as you sail, guide them towards where and what they need to do and eventually they will start knowing your behavior and act on it, on their own. Big ship, big guns, big challenge. Being successful in combat can be a real pain, even for the most experienced sailors out there. Before engaging into a fight, establish certain roles and instruct your crew what to do, based on the situation at hand. Keep the sails angled at all times, cause failure to do so will result in not even entering or exiting a fight. What’s the point of firing a cannon if you can’t keep up with the enemy ship? You don’t need full sails when fighting a ship though, especially if it’s a sloop. Against that little rascal, you need maneuverability and not speed; less sails equals more maneuverability. Agree between yourselves who will go below and perform repairs when taking fire, while the other two crew members stay on the guns. It’s really important to repair your ship at all times, never forget that. Again, the key to a successful fight is an efficient communication. The Brigantine has a unique design, a different one from both the galleon and the sloop. It is a vessel equipped with two sails, one in the back and another one at the middle. The anchor is placed in front of the ship and we can find two cannons on each side of her. Going below deck, you will find the captain’s quarters at the back of the ship, with the voyage table. Walking towards the front, right in the middle you will find the barrel for planks followed by the brig and the map, which is all the way in front of the ship. On the port side you’ll be able to access the cannonball containers, the equipment, clothing and vanity chests while on the starboard side you’ll find the ammunition box and the barrel of bananas. Want to have a race? Then, the brigantine is your best bet. She is the fastest of them all, but speed is not always the answer. Because of her clunky maneuverability you will have to plan ahead each turn in order not to crash. Same as with the galleon, the brigantine has a visibility problem due to the middle sail and my advice is to keep it a bit raised. With the brigantine you need to be a lot quicker when it comes with angling the sails, dropping the anchor, etc. because of her speed. The brigantine is considered a middle-class ship when it comes to fighting. You and your other two crewmates will have to work together even more than on the galleon if you wish to stay afloat. You will have to decide who’s going to repair, to steer, to fire and so on. Use the speed of the brigantine to your advantage. Keep your distance and move around in order to land hits and make it hard for the enemy to hit you back. It’s important to realize that the brigy has only one lower deck and it can fill up with water really fast. The Rowboat is a … boat for rowing. Well, there’s not much to say about it except that it can carry up to 4 pirates, one in the back, two in the middle and one on the oars. The trickiest part is to use your hands simultaneously in order to move forward and to use the correct oar to steer left and right. It can move surprisingly fast and it’s ideal to use if you want to squeeze in tight or awkward place. One important aspect would be to always remember where you left your ship so that you can row back to it from the island! As the saying goes, “the sea is the limit!” or something like that. Fill it up with kegs and crush into a ship or engage into sneaky combat. Be creative! I know I’ve stated this already, several times, but communication is the key to success. It doesn’t matter if you’re using a microphone or non-verbal communication, talk with your crew. Bond together, for this bond can and will save your life out there, on the sea. Don’t criticize someone when they do a mistake; help them understand what they did wrong, for you may never know when your time to “f” things up comes. Thus, treat your crew the same way you want them to treat you. No matter what type of ship you’re sailing, certain rules are universal. •	Stay with the wind as much as you can and keep the sails angled at all times. •	Start raising the sails as you approach your destination. •	Ready your ship after anchoring; check that the sails are up, raise the anchor, turn the ship accordingly and angle the sails. As with navigation, there are also certain universal rules for combat. •	Wait for the enemy ship to be above the wave. •	Only shoot if you are sure you can hit; do not waste ammo. •	Do not make a turn before your enemy; keep an eye on their sails, for when they are changing the angle, it will give out their intention. •	Power is not always the answer, use your brain at all times. Outsmart your opponent if you wish to win. •	It’s never a shame to make a tactical retreat if you see that the battle is not going in your favor. Live to fight another day. •	Do not engage into a fight that you cannot win; if you are low on resources, stay clear. •	If all things fail, parley. You’ll be surprised how effective communication can be, even with enemies. I think it’s clear that you are not allowed to be a “d” to other players and the picture above elaborates on that. One thing I care to add is to have a moral compass, adhere and respect everyone, especially your enemies. If they ask for a parley, stop firing upon them and start working on the arrangements of their surrender. Fighting is not everything this game is about, so keep that in mind. Thank you all for being here and being such a cool community. Sea of Thieves is like a big family and this tutorial was meant to help my little sisters and brothers on the sea. I hope that it was easy to follow and that you managed to learn a thing or two out of it. I will try and update it on a regular basis, with various information. @eredhar Make sure you backup the guide in case they clean the forums again hahaha. And thanks for taking the time again to post a guide for new and not so new ones. A really superb beginners guide, thanks for posting! @katttruewalker laughs My pleasure haha. Use them wisely ! Nice guide! But for us who have played on the scaletest.. Will the character be reset when the game launch 20 march ? @lumpaywk Sadly, it needs to be updated. I promise that I will do it as soon as I have some time. For any questions, feel free to contact me. @eredhar AYE me lad, for a pirate&apos;s work never ends! The world be constantly changing during these times! Make sure ye don&apos;t overwork, for yer tutorial might turn into a guiding manual! Aye! Nice work, good looking out for the new folks! Well done, it’s a really nice tutorial. Everything you say is how I like to navigate. Specially for raising the sail before dropping the anchor, adjust the length of the sail as you don’t need full speed every time and invok parley more than shoot on sight. All that make your playtime more enjoyable, more role play than just game mechanics. I’m sure this post will help a lot of new pirates. Maybe could add a little tip specially on a solo sloop. You can see the world map from the upper deck just by looking back down behind the anchor, if you get lost you don’t need to go below deck to check if you are on the right direction. It can be done as well on the galleon from the wire rack on the deck but I find it less effective. Hope i’ve Been clear enough my English is not my first language. @qowywyop That&apos;s an accurate tip. @eredhar Awesome tutorial but i notice you left out how to actually start a voyage. Was this on purpose? Great info, thanks for writing this up. Intrigued to see how many will follow the Parley system! you know that you can shoot through waves? And you didn&apos;t mention that you should shoot as in the water to hit the bottom of their ship. yes it&apos;s possible to hit the water and then their ship, these holes are the most dangerous for the enemy. Great guide for newcomers - is it possible to pin? @joda1123 That&apos;s correct. If you are close enough and shoot through waves, you can hit your enemy. All it takes is a bit of practice. @sshteeve My pleasure and again, I need to update this Tutorial as soon as I can. I just got the game to load after the connection errors. While I&apos;m walking around the beginning island to try and figure out how to play the game two pirates keep shooting me in the back and I can&apos;t even learn the ropes! This is so frustrating! I hope the whole game will not be like this.. what a waste of money!!! @guymom There is alot of PVP and you really need to be quite aware of your surroundings. NO place is 100% safe! Being in the same outpost for too long isn&apos;t very wise since there&apos;s gonna be someone going there. I&apos;d advise you play with a friend, if any who plays this and just look around from the crows nest from time to time. Keep your distance, use that spyglass o&apos; yours and you should be fine :) Maybe look up a few quick tips videos or something and shut the ship lanterns off since you are very easily spotted at night from afar. On another note, there&apos;s still people who seems friendly out there. I met a few yesterday even, and I just had a session with friends, both in 4man Galleon and a 2man Sloop, and we had almost no battles, if even a single battle! Sometimes you can go easy and take a rest, but most the time, action blasts open the door. TL;DR People will mess you up most the time if not carefull. Use that crows nest and spyglass! It&apos;s Sea of Thieves for a reason. Has been updated with the Gold Hoarder, Order of Souls and Merchant Alliance. The Map has been updated with all the islands and locations as of 24th of March 2018. Types of Animals have been added to each island. So do I, but my faith is slipping. Can someone help me anchor my boat correctly. Every time we put the anchor down and the sails up and we leave the boat it just ends up sinking. But most of the time the boat is pretty close to land and it still does it. Help me please! @nolander15 Well, from what I can tell, you are bringing the ship too close to the shore and it hits the shallows. You might be taking water. My advise would be to get the sails up in time, so that you will slow down as you reach the island. Pay attention to the sound, because it will tell you if you hit the shore. Remember, if the sails are up, you don&apos;t need to anchor; the ship will eventually stop by itself. Also, the less speed you have upon crashing, the less the damage.